Using ABS plastic (the material used by many 3D printers), 3Doodler draws in the air or on surfaces. It’s compact and easy to use, and requires no software or computers. You just plug it into a power socket and can start drawing anything within minutes. That hit a nerve with me, because I immediately went and backed the Kickstarter. It's a brilliant idea, and I can only image how artists (and kids) will make use of this. It's also a good example of a Kickstarter that goes thermonuclear. The original goal was a very modest $30,000. The current total is $2,240,166, and there are still 10 days remaining. The Kickstarter page is here, and there's also some detailed information here: The World’s First 3D Printing Pen that Lets you Draw Sculptures. Richard Garriott also has a Kickstarter up for a new game titled "Shroud of the Avatar: Forsaken Virtues." Part of me has been hoping this would happen, and part of me dreaded that it would happen. 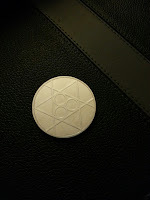 That's the coin that came with Ultima IV, which I purchased in 1986. Twenty-seven years later, I still keep the coin close. So if there is any single series that I am entirely, absolutely bound to, it's Ultima. I also know that the last excellent Ultima (for me, at least) was published in 1992. Since then, Garriott made one disappointing Ultima (VIII), one absolutely terrible Ultima (IX), Tabula Rasa (failed), and he spent $40 million to go into space. Want a cloth map for this game? Try the $125 funding tier. Want a coin? That will set you back $150, although you'll also get the map. The entire, slightly vainglorious Kickstarter pitch can be boiled down to this: "I was the best RPG game developer back when computers had 64k of memory." I exaggerate, of course, but the pitch certainly has that vibe. So here's possibly a salient question: has anyone else made an excellent game after twenty years of disappointments and absence? Nothing would make me happier than if this game turned out to be absolutely outstanding, and I ate large plates of crow. And maybe that will happen, but I don't see much here on Garriott's side. I would actually have felt much better if he had acknowledged the Morrowind series, which is unquestionably brilliant and certainly the spiritual successor to Ultima. Instead, he acts like RPGs stopped moving forward the day he stopped designing them, and that's too bad. Kickstarter: Shroud of the Avatar: Forsaken Virtues.